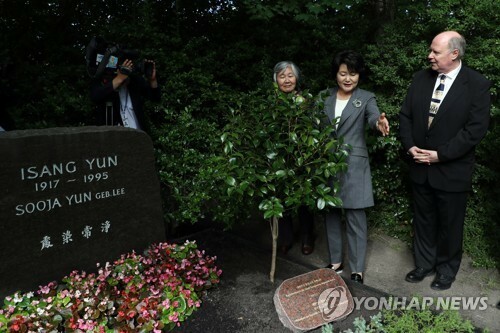 The state-run Korean Culture and Information Service announced this year’s winners for the annual award which included Walter-Wolfgang Sparrer for his commemorative work on Korean composer Yun I-sang (Isang Yun) in Germany. Yun, considered one of the most influential composers in modern Korea was born in Korean under Japanese colonization and made his later career in West Germany. Sparrer has worked to commemorate his work through various activities including foundation of Internationale Isang Yun Gesellschaft e.V. (International Isang Yun Society) in 1996. French writer Herve Pejaudier, was commended for co-translating 14 Korean literary works into French. Other winners were: Freddy Jacques Andre Bozzo from Belgium, who introduced Korean movies to Europe; Li Xincao of China, former music director of the Busan Philharmonic Orchestra; Raden Franki Suryadarma Notosudirdjo of Indonesia, who contributed to musical exchange between Korea and Indonesia; Shimizu Moeko of Japan, contributing to Korean culture through social media; Kim Hye-seon of Korea, a contributor for UK/Korea 2017-18; and architect Ahn Tae-jun, whose work in Europe was commended as boosting the image of the Korean government.